EU leaders are to meet for an emergency summit in Brussels to decide whether to offer the UK another delay to Brexit.Prime Minister Theresa May wants to postpone the date the UK leaves the EU beyond this Friday, until 30 June.But the EU is expected to offer a longer delay, after European Council President Donald Tusk urged the other 27 leaders to back a flexible extension of up to a year - and with conditions.Every EU member state needs to agree before a delay can be granted. So far, UK MPs have rejected the withdrawal agreement Mrs May reached with other European leaders last year, so she is now asking for the leaving date to be extended. 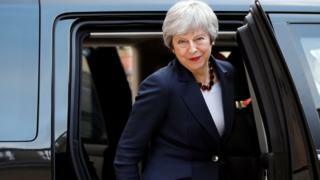 If no extension is granted, the default position would be to leave on Friday without a deal.Mrs May will head to Belgium this afternoon, after her weekly clash with Opposition leader Jeremy Corbyn at Prime Minister's Questions in the House of Commons.That head-to-head follows five days of talks between the government and Labour officials aimed at breaking the Brexit impasse.At the summit - which begins at around 18:00 local time (17:00 BST) on Wednesday evening - Mrs May will formally present her case for a short delay until 30 June, with the option for the UK to leave earlier if her Brexit deal is ratified.The other EU leaders will then have dinner without her and discuss how to respond. In a formal letter to the leaders on the eve of the summit, Mr Tusk proposed a longer, flexible extension - although "no longer than one year" - to avoid creating more cliff-edge extensions or emergency summits in the future. Any delay should have conditions attached, he said - including that there would be no reopening of the withdrawal agreement talks. And the UK would have the option to leave earlier if a Brexit deal was ratified. Referring to Mrs May's proposal for an extension until the end of June, he added there was "little reason to believe" that Mrs May's deal could be ratified by then.And if the European Council did not agree on an extension at all, "there would be a risk of an accidental no-deal Brexit", he said.Mr Tusk also warned that "neither side should be allowed to feel humiliated at any stage in this difficult process". EU officials have prepared a draft document for the leaders to discuss at the summit - with the end date of the delay left blank for them to fill in once deliberations have ended. BBC Europe editor Katya Adler said the fact the length of delay had been left blank in the conclusions showed EU leaders were still divided on the issue.The BBC's Europe correspondent Kevin Connolly said "much has been spelled out in advance", including the condition that if the UK remains a member of the EU at the end of May it will have to hold elections to the European Parliament or be forced to leave immediately.He added that, during the delay, the UK would be expected to commit to not disrupting EU business, such as the preparation of the next budget, and its influence "would be sharply reduced and its voice muted".On Tuesday, Mrs May travelled to Paris for talks with French President Emmanuel Macron and then Berlin to meet German Chancellor Angela Merkel, in a bid to seek their support for her shorter delay. 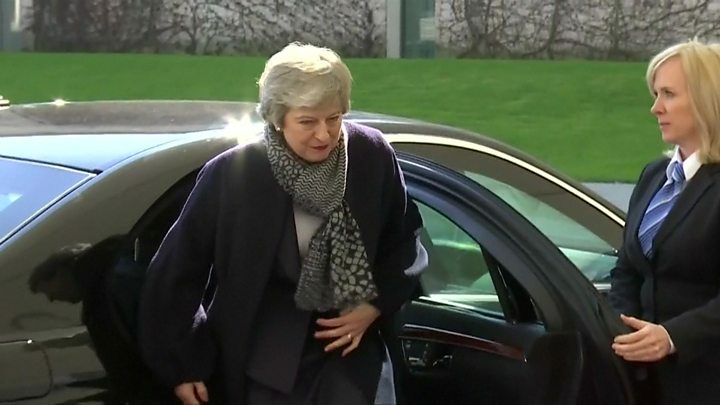 Afterwards, Ms Merkel said a delay that ran until the end of this year or the start of 2020 was a possibility.In a statement, Downing Street said the prime minister and Chancellor Merkel agreed on the importance of ensuring Britain's orderly withdrawal. Meanwhile, talks between Labour and the Conservatives are scheduled to resume after Mrs May returns from the summit.Environment Secretary Michael Gove said the talks had been "open and constructive" but the sides differed on a "number of areas". Labour's shadow business secretary Rebecca Long Bailey said they were "hopeful progress will be made".